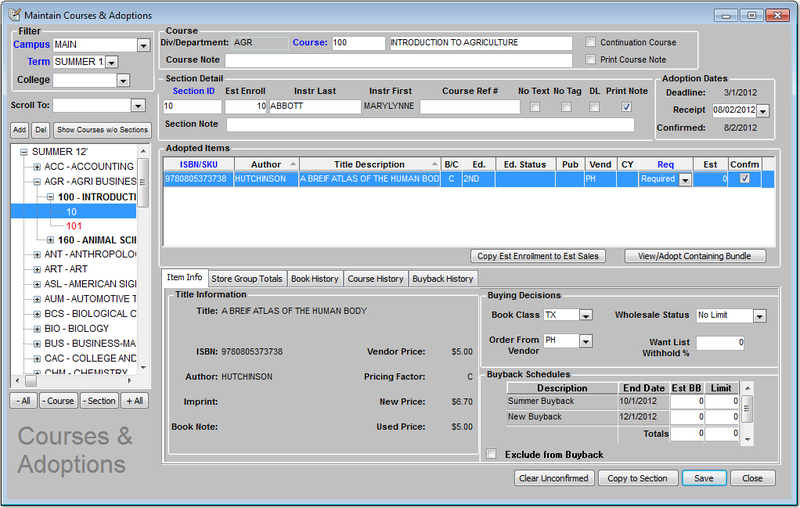 Booklog’s Course Materials Management (CMM) is a fully-integrated module that assists college bookstores in maintaining an efficient store inventory. Bookstore staff can review and analyze historical sales behavior by item, course, and instructor in order to make informed buying decisions. Based on the data entered, Booklog’s CMM can assist with automated processing of want lists, purchase orders, and returns. True to its name, Booklog’s Course Materials Management module manages everything needed for a course. Whether it’s a pair of goggles, a lab manual, a book, or all three in a kit, Booklog can handle it with ease. At buyback, you can choose to buy back individual pieces of the set or require that all components be returned in order to give cash back.